As of AW2017, Albion changed the formula of one of the lines, INFINESSE. Infinesse Moisture Milk IA changed to Derma Pump Milk. How is the formula is changed? Previously, on 2015, I had used whole of Infinesse line. And as of 2017, I kept a sample to review the difference. 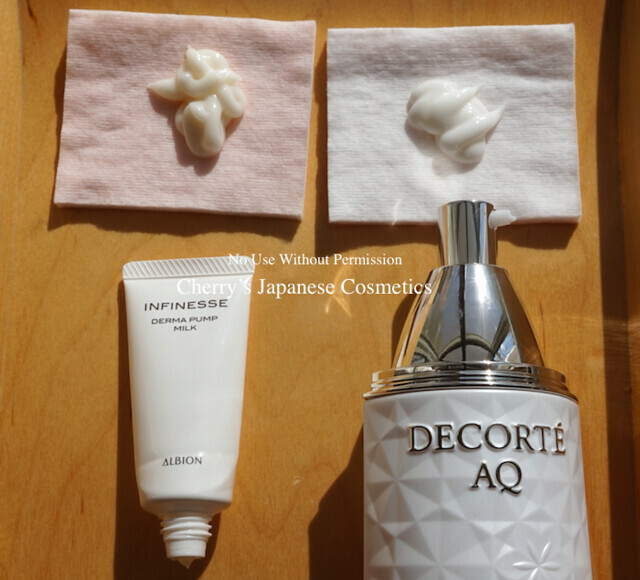 Let me compare Infinesse Derma Pump Milk and Infinesse Moisture Milk IA. And I had compared with Infinesse White Whitening Pump Milk. Please See also Albion Infinesse White Whitening Pump Milk made my skin moist and well prepared for other treatment! Albion is famous as its unique method: wash, milk, lotion, and extra items. In other brands, this “milk” is called as “emulsion”. Like Fancl, there are some not oily emulsions, but Albion’s milks are oily. This Infinesse Derma Pimp Milk too. As I had described, Albion recommends to use 3 pushes each, but sometimes I apply 6 pushes or more, or 1 push, to seeing my skin condition. The reason why they recommend to use their milk first, originally it means removing all of makeup removers or something left from your face. So, they recommend to use cotton to wipe your face softly. But I use face wash after my makeup remover, I need both water and oil. According to Albion, their milk is the same balance with ideal skin water/ oil balance. I do not hate applying their milk on my washed face. Hmm, are there any difference? The difference is the very “color”. You can see the difference significantly, the new Derma, the left is more yellow than previous formula of Moisture. Both of the texture is harder than other Albion milks. There are no sting with Infinesse milks 🙂 Sometimes I feel sting with skincare products, but usually I have no need to worry with Albion items, as long as my skin condition is better. I do not use Albion products when my skin condition is not nice. I run to Fancl. There is a huge problem of buying Infinesse whole line by myself, the perfume. My nose is almost broken (due to the Allergic, and not a big problem, simply it means it is Autumn :D), but I can find the strong scent of “Infinesse”, seems they had not changed. Albon claims this Infinesse line is for working ladies who are super busy. The problem of Albion skin care method is the milks tends to take time to be smooth on your skin. Infinesse is the quickest among Albion milks. I used almost the same quantity for each sides of my face, and they are coming to smooth on the same time. Albion also claims this Infinesse is for the function of supple skin, aka lifting your face up. In person, it is not what I am expecting for my skincare products, and I have still enough supple skin. I felt something “strange” with using Infinesse milks, it can be called for “lifting”, but in person, it is a kind of tight, both of the sides. Botton line of the comparison. I could not find any difference between the new Infinesse Derma Pump Milk and previous Infinesse Moisture Milk IA. If you liked the Moisture Milk IA, you can use this Derma Pump Milk without anything strange (excluding the color of the milk). 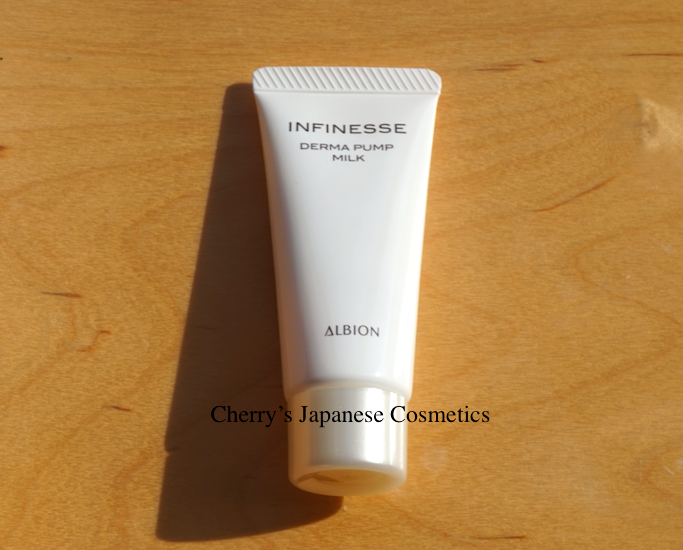 Please check the latest price, and order from here: Albion Infinesse Derma Pump Milk or in our JPY Branch! I will compare other products later. Some of the customers ask us that the difference between Exage Milks and this Infinesse. Albion claims, Exage is for the function of moisturizing, and Infinesse is for supple skin. There are Exage Milks, let me compare. Because it is not mine, the owner of this #1 is a lady who is working for us, so I was hesitated to push only once, and I took Infinesse almost the same quantity in my eyes. One push each for both of my sides. To be honest, I could not find anything difference excluding the perfume. Too little to know. I needed to use more. I had learnt! Two pushes! I pushed twice the #1, for my right side, and Infinesse is almost the same quality in my eyes. Two pushes each, and total 4 pushes for whole of my face. You may see the yellow/ cream color on the left, Infinesse, and its texture is harder than Exage #1. As the BC of Albion claimed that it is Infinesse that the most quick to be absorbed, I am not sure about “absorb”, but I felt the surface of my left side, in other words Infinesse side was quicker to be smooth. Afterwards are different, Exage side is more “natural”, and Infinesse side is “wired”, yes “lifting”. If you are looking for something “lifting”, Infinesse is for you. And moisturizing level are a little bit different. I am feeling Infinesse side is a little bit more oilier than Exage #1 side. Guess if you are a repeat user of #1, Infinesse Milk will be too much for you. This is also not my own. Infinesse is quicker to be smooth, but Infinesse side is more oily and something lifting up (not tight). Exage side is more “light” and smoother after 5 mins. 2 pushes for Exage #3, and Infinesse is almost the same quantity by eyes. I need to tell you again that Infinesse is “lifting” up, and get smoother quicker than Exage #3. Indeed I felt it is Exage #3 what moisturized more. So, compared with Exage Milks, I get these result in person. I guess I have no need to compare Excia AL Ambeage line, it is too rich if you are keep using Infinesse. I think “Excia AL Renewing” are much better to compare. I found a sample of Excia AL Renewing Rich Milk SV. As compared with the Infinesse Milk IA (previous formula), I do not want to left in this small package, I needed to use all, probably 3 pushes from the bottle. Infinite Derma Pump Milk is almost the same quantity with the Excia, by my eyes. Renewing line has a function of aging care. I choose Renewing line, due to the scent is acceptable than other Exage or Infinesse. It is Infinesse that is getting smooth quicker than Excia Renewing. The moisturizing level is almost the same, and Infinesse side is more smoother than Exicia side. I felt Excia Renewing Rich Milk more oilier than Infinesse. I have tested many skin care items for you, and in Albion (they are good products!) what I buy for myself is Excia, it is only for the perfume. Yeah, both are strong, but Infiness is stronger than Excia, and this floral scent is not my preference. But it is really easy to find reviewers are saying this Infiness scent is gorgeous or something. That is just in person. Compared with Exage milks, I felt “lifting” thing, but with Excia Renewing milk, I did not feel that in my left (Infinesse side). One possibility is the right (Renewing side) is the same 😀 You know, I am a repeater of Excia AL Renewing Milks, but I do not remember I had felt the wired “lifting” thing. Another possibility is I am keep using this Infinesse for almost one week (to review for you). My left side skin is too familiar with this function, and did not feel it is wired. I do not know. This is comparison is the final for the comparing Albion milks session. Final is Infinesse Derma Pump Milk & Excia AL Renewing Extra Rich Milk SV. I worried there are not enough to compare, I took all and seemed the quantity is almost the same with 2 pushes of Excia. Excia is more runny than Infinesse milk, it is coming to flat while I was ready to shoot. In this time, I felt “lifting” function for the Infinesse side only. Infinesse is coming to be smoother quicker than Excia. And it is Excia Extra Rich what made my skin moisturized. But I can say about moisturized and oil thing. Because of the whether, chilly, but sunny, it is drier (than other seasons for me, but I know it is not pretty much dry for you especially people from the mid continents of the Americas/ Europe/ Australia). I feel my skin is coming to really dry. But I also dislike items what makes my skin sticky. I bought Excia AL Renewing Extra Rich Milk SV for myself, but it is too much, I often feel. Oops, let me back to my skin texture afterward, I feel my both sides were well moisturized, and kept by oil. Both Infiness and Excia AL Rich are good for my preference. I choose Excia, just because of the perfume, and I like Cosme Decorte AQ Emulsion more than the scent of Excia. Compared with Excia AL Renewing Milks, I got these results, in person. The result is the same with the previous formula. If you are a person who are in love with Excia milks, guess Infinesse Derma Pump Milk can be not enough for you. In other hands, switching from Infinesse to Excia, try Excia Rich Milk first. Extra Rich Milk can be too much. Final comparison with this small tube is my routine. Cosme Decorte AQ Emulsion ER. As I had expected, Cosme Decorte AQ ER is oilier than this Infinesse. I think if there is AQ Emulsion Rich, it can be a wonderful comparison. Anyway, with AQ ER. AQ Emulsion ER is also quicker to be smoother than Albion milks, but I felt Infinesse is more quicker to be smoother than AQ Emulsion. I felt “lifting” on the Infinesse side, but there are no such feeling on AQ side. Suqqu Moisture Rich Lipstick is fantastic!! !